Andy Windak is a private chef in Hollywood, CA. He spends most of his time cooking for a boutique animation studio and dreaming up wild dinner parties for other clients. You may see him riding his bicycle around the streets of LA, perhaps with a bouquet of flowers or baguette from the farmers market peaking out of his messenger bag. Follow his whimsical food adventures on Twitter, on his blog The Wind Attack, and on his podcast The Table Set, where he chats with his friends Greg and Nathan about entertaining. The first time I had Kombucha, I bought it by accident. I had stopped by Whole Foods for lunch one day and decided to get myself a fancy beverage, staring at the various bottled tea drinks and was intrigued by something labeled as “Gingerberry” flavor. When I got back to my office, I opened the bottle and was, firstly, shocked by its violent effervescence. Then I tasted it. I was repulsed by its pungency. “What on earth did I buy?! ?” I wondered to myself. The bottle listed all kinds of supposed health benefits. “Active Enzymes, amino acids, detoxifiers,” etc. I love my kale and quinoa and all other realms of health food, but I couldn’t for the life of me finish that bottle of Kombucha. Flash forward five years, and not only do I love Kombucha, but I’ve started brewing it myself. It’s an acquired taste, just like coffee, or beer or wine (or kale?). So what is Kombucha? It’s a “cultured” sweet tea, but it’s not sweet. The “culture” of bacteria and yeast ferments the sugar and leaves you with acids and enzymes and, yes, even a little bit of alcohol. So Kombucha contains both caffeine (from the tea), and alcohol (about 1% ABV.) However, it’s not going to get you drunk, and it’s way better for you than a vodka and Red Bull. Why do I like drinking kombucha now? It’s crisp, refreshing, bubbly, tangy and leaves you with a feeling of well-being. Perhaps you already are a kombucha drinker and you know that. Then you also know that it’s expensive when you buy it at the health food store. But here’s a secret: it’s not expensive to make. It’s not terribly difficult to make either. Best of all, when you make it yourself, it can end up tasting even better than the stuff you buy in the store. The three basic ingredients you start with are filtered water, black tea and sugar. I normally use organic turbinado raw sugar for my kombucha, but I decided to step it up for October Unprocessed and used a creamy California wildflower honey. 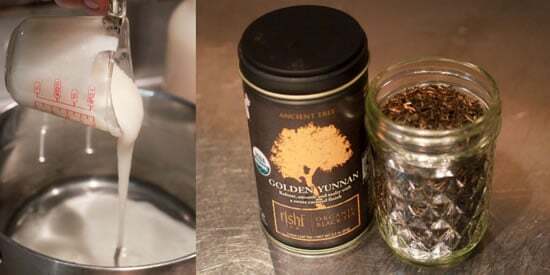 For my tea, I used Rishi Tea’s organic golden yunnan. It’s smooth and sweet, which makes for a good kombucha base. You can use most any tea for kombucha, but I recommend black tea, as it produces a more robust end product. Green or white tea would be too delicate. High quality organic tea can get expensive, but when you calculate out the cost per bottle, it’s still less than the kombucha you buy in the store. To make a two gallon batch of kombucha, start with two gallons of cold filtered water in a large stock pot. Dissolve in two cups of sugar or honey and bring the water to a boil. Add 8 heaping tablespoons of loose leaf tea. Mix it in, remove from heat and cover. Steep for 15 minutes, then strain into a large, wide glass jar. 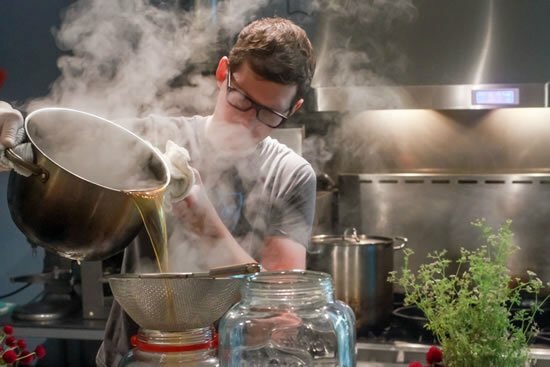 Making kombucha is very much like making beer. You start with a sugary liquid, add yeast and let it ferment. Just like when making beer, you can’t add the yeast to the wort when it’s still steaming hot. You have to let it cool to below body temperature to avoid killing your yeast culture. So go ahead and add a large chunk of ice to your tea, otherwise you’ll be waiting a while. Then I like to stick the jar in the fridge to accelerate the cooling process. Once it cools to a very neutral temperature (stick your finger in it! ), you are ready to add the culture. The most essential ingredient to kombucha is also the hardest to come by: the SCOBY (symbiotic culture of bacteria and yeast). 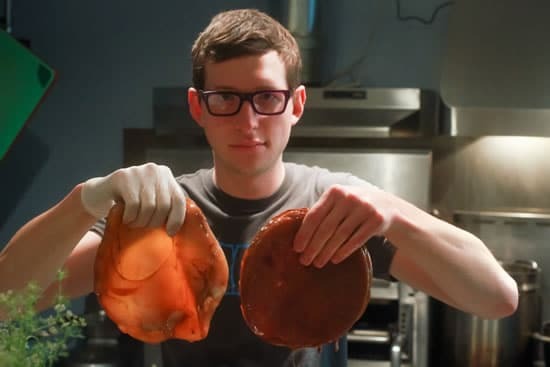 The SCOBY is often referred to as the “mother” and is a gelatinous pancake. It’s kind of terrifying. I like to name my mothers. The one I used on this batch was called “Peppermint Patty.” Just slide her into the jar of cool tea and you’re good to go. The mother will float to the surface naturally. The other ingredient you need before you start fermentation is a bit of finished kombucha to get your new batch rolling. On your first batch, you are probably going to have to go with store-bought (unless your mother came with some). Two cups of mature kombucha should be enough to get your two gallon batch going. The final ingredient is time. 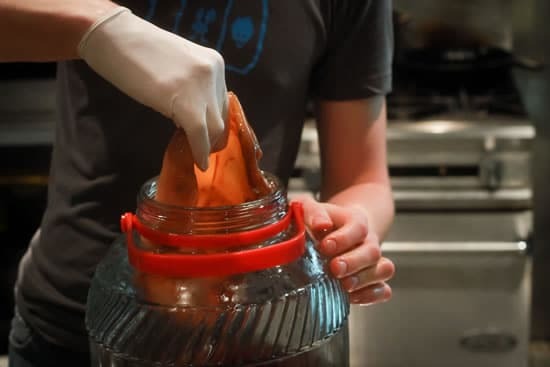 Cover your glass jar with a towel and rubber band. If you cover it with a lid, it will build up pressure and could possibly explode. If you left it completely uncovered you’ll get a family of fruit flies. Not fun. Place your jar in a safe, dark place at room temperature. I like to cover my jar with a paper bag. Why? Because it keeps light out and keeps people from asking what that disgusting looking jar is. Then leave your kombucha to ferment. Temperature affects how rapidly your kombucha will ferment, so it is not unwise to taste it every few days. After about a week it will take on an acidic cider-like flavor. I usually ferment for 9-10 days at 70 degrees, but use your own taste as a guide. If you want your end product sweeter, ferment it less. For a dryer, more acidic kombucha, ferment even longer. Once your kombucha is close to where you want it, you’re ready to (optionally) flavor and bottle. I like to keep it simple, but adding things like fresh ginger juice, berry juice, lemon juice (meyer lemon is especially nice), etc. can be fun. For this batch I added 1/4 cup blended, strained passionfruit pulp and 1/2 cup lemon juice. I recommend leaving your first batch plain, and then getting creative later. To get your kombucha to be effervescent, you need to let it ferment further in a lidded container to build up pressure. Beer bottles with crown caps work well for this and extend shelf life. Maybe you or someone in your life is a functioning alcoholic. If so, you have a steady supply of free bottles for your kombucha. If you don’t, then you can buy them, along with virgin bottle caps and a capping device at your local home brew shop (or the internet). Soak your beer bottles in an oxy clean bath for 15 minutes and the labels should slide right off. Give them a quick scrub and rinse, and you’ve got a nice clean bottle. 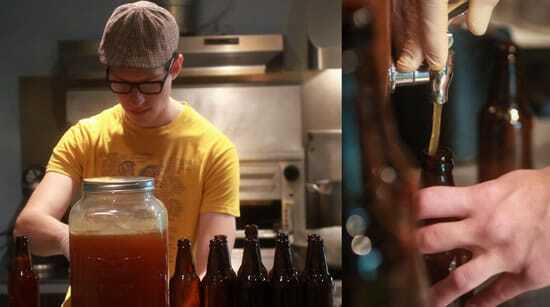 Before you bottle your brew, it’s advisable that you sanitize your bottles. You could boil them, but then you would have to wait for them to cool off. I prefer to sanitize in an iodine solution. You can buy iodine sanitizer at the home brew shop as well. Just a few teaspoons to cold water will give you a light amber color that will work well enough. Fully submerge your bottles for at least one minute, then drain. No need to rinse. Fill your bottles about 80% full. I used a beverage dispenser with a spigot. You could also use a sanitized funnel. Or if you were really fancy, you could use an auto-siphon (also from the home brew shop). 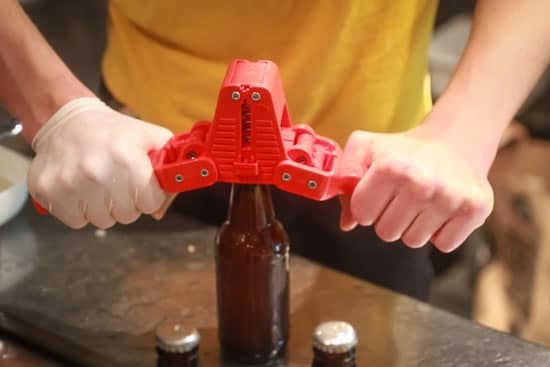 Then use a capper to crimp on your sanitized bottle caps. A two gallon batch will get you about 18, 12 ounce bottles if you are reserving some kombucha for your next batch. Once bottled, you need let sit at room temperature for another day or two to build up pressure. Just give your bottle a shake to see if looks like a bottle of cola. Well you’re waiting on the secondary fermentation, why not design a cool label? I print mine with a copy machine, then stain the paper with coffee (or tea, or kombucha!) and glue it on with a glue stick. 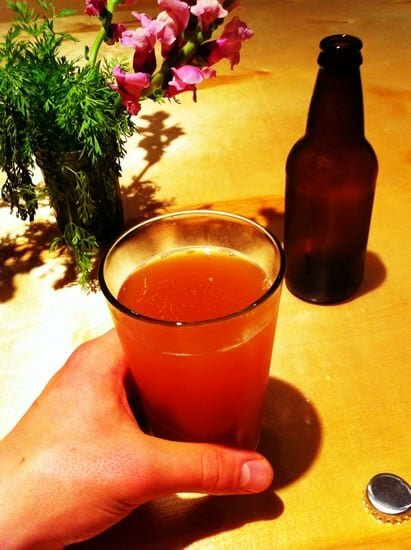 Stick your completed kombucha in the fridge to halt the fermentation and enjoy! But why stop at drinking it? I like to use kombucha for cooking as well. I’ve used it for steaming mussels (instead of using beer or wine). I also like using it in onion ring batter. If you ferment too far, then you have kombucha vinegar. Salad dressing anyone? Thanks for the article & the photos! I’ve made kombucha a few times, but haven’t been drinking enough to keep up with the production. I love your suggestions about cooking with it, & plan to give that a try. Also, the first time I made it, I just poured in a store-bought kombucha with some “junk” in the bottom. (I did not know where to find a mother.) It worked, and a couple of weeks later, I had my first mother. Also, the recipe I had back then (long since lost) said that you don’t need to be very careful with the mother. Just hack off a piece of any shape, & you have 2. I’ve also done this successfully, although it feels a little disrespectful! Happy brewing. Great article. 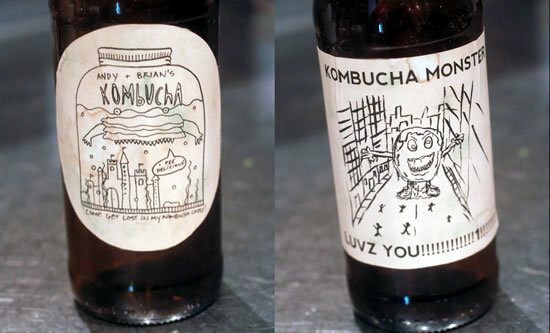 BTW LOVE the “Kombucha Monster” label! How can I get one? Can you dry the “mother,” or freeze it the way you do sourdough? We were given a kombucha “mother” 15 or 20 years ago – the friend who gave it to us called it a “mushroom” – and didn’t much care for it. I think I composted the whole shooting match, after a couple batches. But tastes do change. I have no idea if freezing works, but I’ve got so many mothers lying around, I might try it. I keep my mothers in a jar in the fridge.